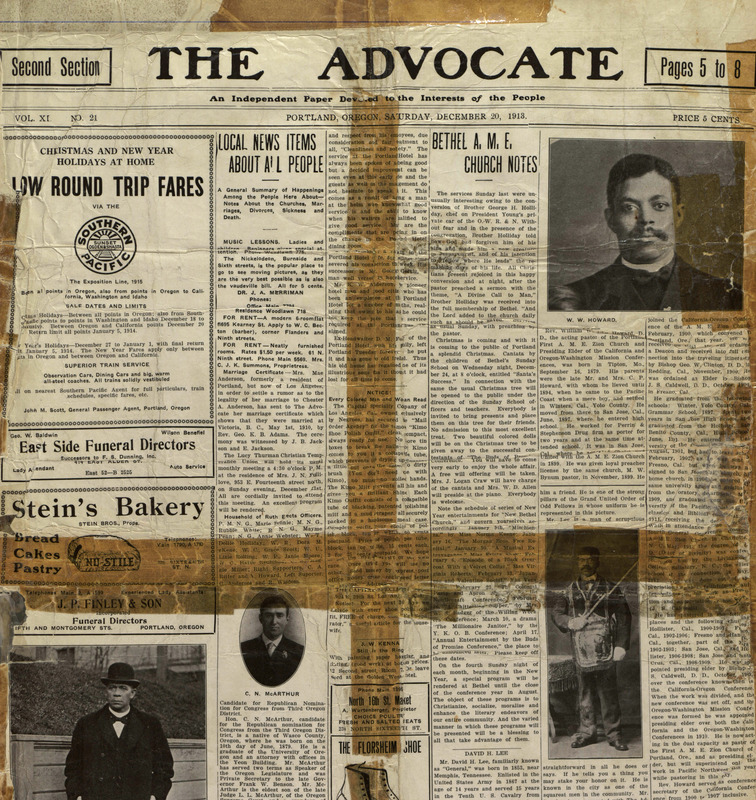 Awarded 2016: The PSU Library is pleased to announce it has received a $5000 grant from the Oregon Cultural Trust to preserve and make accessible its historical collection of local Black-owned and published newspapers. The newspapers were donated to Portland State in 2012 by Charlotte Rutherford as part of the Verdell Burdine and Otto G. Rutherford Family Collection. The collection documents over one hundred years of Black community history in Oregon and includes photographs, scrapbooks, organizational records, personal papers, and publications. Its newspapers, dating from the 1910s through the 1980s, are a unique window to the national, regional, political and cultural context of their time. With photos and announcements of local events and ads from businesses, they also capture the vitality of the community over time. While in high demand by researchers, educators and students, regular use puts the original newspapers, many the only known print copies, at great risk. This grant will support the digitization of the collection to preserve it and make it available online. It will also fund the printing of full-size color facsimiles that can be safely shared at community events and in classrooms. The project will be overseen by the Library’s Head of Special Collections. Awarded 2013: The Portland State University Library has received $2,000 in funding support from the Public Education for Peacebuilding Support initiative of the United States Institute of Peace (USIP). The support will enable the Portland State University Library and Middle East Studies Center to present programming to introduce, promote, complement and contextualize the Bridging Cultures Bookshelf: Muslim Journeys, a collection of books, films, and other resources chosen with a view to familiarizing the American public with Islam and the cultural heritage of Islamic civilizations around the world. Awarded 2013: Portland State University Library is one of 840 libraries and state humanities councils across the country selected to receive the Bridging Cultures Bookshelf: Muslim Journeys from the National Endowment for the Humanities (NEH) and the American Library Association (ALA). The program aims to familiarize public audiences in the United States with the people, places, history, faith and cultures of Muslims in the United States and around the world. The books and films comprising the Bookshelf were selected with the advice librarians and cultural programming experts, as well as distinguished scholars in the fields of anthropology, world history, religious studies, interfaith dialogue, the history of art and architecture, world literature, Middle East studies, Southeast Asian studies, African studies, and Islamic studies. The Bridging Cultures Bookshelf: Muslim Journeys is a project of the National Endowment for the Humanities, conducted in cooperation with the American Library Association. Major support for the Muslim Journeys Bookshelf was provided by a grant from Carnegie Corporation of New York. Additional support for the arts and media components was provided by the Doris Duke Foundation for Islamic Art. Awarded 2012: The Oregon Cultural Trust awarded the University Library $5,000 to support the Portland JACL historical records project. The University Library’s Special Collections is the steward of over 23 boxes of historically important records from the Portland JACL. Funding from the OCT, matched by a donation of an additional $5,000 from the Portland JACL, supports identifying, organizing and preserving these aging and often fragile materials and launch an online searchable finding aid that will be made available to the public, including researchers, educators, students, and community members. The Japanese American Citizens League is the country’s oldest Asian American organization dedicated to preserving civil rights in the United States. The Portland chapter’s records cover a pivotal period in national and local history from the 1930s to the 1980s. Awarded 2011: This three-year grant for a total of $999,493 will focus on using data from more than 23,000 users of Learner Web to produce information that will help libraries tailor learning and literary services more effectively to prepare more individuals to cross the digital divide, use broadband services, and participate in an increasingly digital world. Learner Web is an online learning technology as a tool that libraries and other community-based organizations can use to help diverse under-served adult populations bridge the digital divide. Dr. Stephen Reder, Professor of Applied Linguistics, is the project director and founder of Learner Web. Kimberly Pendell, Social Sciences Librarian/Assistant Professor, will serve as a project advisor. The Library will receive approximately $18,715 over three years. Awarded 2011: A consortial endeavor led by Western Oregon University, the project will focus on processing, preserving and promoting access to three significant Oregon gubernatorial collections, the Barbara Roberts Papers at Portland State University, the Victor Atiyeh Papers at Pacific University, and the Robert Straub Papers at Western Oregon, with guidance from the university archivist at Willamette University’s Mark O. Hatfield Library. The Barbara Roberts Papers are part of the Oregon Political Leadership archives, a shared project of Portland State’s Center for Women, Politics, and Policy, University Library, Department of History, and the Black Studies Department. Housed in the University Library’s Special Collections, the papers are a comprehensive documentation of Roberts’ groundbreaking political career, including her role as the first woman in Oregon to hold the positions of House Majority Leader, Secretary of State, and, from 1991 to 1995, the Governor. Included in the papers are Roberts’ hand-written manuscripts for her autobiography Up the Capitol Steps: A Woman’s March to the Governorship, published by the Oregon State University Press in October 2011. Awarded 2011: This grant, funded through the the Library of Congress, provides support to create a film preservation master and two access copies of the student film, Albina Mural Project. Shot during a year-long project by eight local artists to paint and install 120 feet of original mural panels in Portland’s historically African American neighborhood of Albina, this film captures both the artists’ perspectives on the role of their work and the community’s excitement and support for the project. By 1982, the murals had begun to deteriorate from exposure and were taken down. Albina Mural Project is the only known footage of the full mural during its public display. Films saved through the NFPF programs are made available for on-site research and are seen widely through screenings, exhibits, DVDs, television broadcasts, and the Internet. Awarded 2010: This grant, funded through the the Library of Congress, provides support to create a film preservation master and two access copies of the student film, The Seventh Day. The film concerns the seven-day student strike at Portland State University, which began on May 6, 1970, as a protest against the Kent State University killings and the expansion of the Vietnam War into Cambodia. It shows various incidents which occurred, such as the clash between the police and strikers on the sixth day and march on City Hall the following day, in protest of the action taken by the Portland Police. Films saved through the NFPF programs are made available for on-site research and are seen widely through screenings, exhibits, DVDs, television broadcasts, and the Internet. Awarded 2005: Portland State Library’s Oregon Sustainable Community Digital Library (OSCDL) is supported by a two-year $127,000 Library Services and Technology Act grant from the Institute of Museum and Library Services, an independent federal grant-making agency. The OSCDL project will provide researchers, practitioners, students, policymakers and citizens with electronic access to detailed information from participating agencies via a searchable Web-based database hosted by Portland State. Awarded 2005: Portland State Library received a collaboration grant to establish a sexual minority library collection at the Transgender/Identity Resource Center for clients and staff of Outside In, a local social services agency. This collection is the first sexual minority library collection in Oregon. Awarded 2004: The Portland State Library received $320,000 in funding from the Institue of Museum and Library Services (IMLS) to enhance its Middle Eastern and Judaic Studies collections, which will support the Portland State Middle East Studies Center and the recently established Judaic Studies Program. Awarded 2000-2002: A two-year IMLS grant was given to Portland State Library to “Build Information Resources for Citizens and Students.” Through this two-part grant, the Library completed cataloging efforts begun in 1996 under a DOE grant entitled “Citizen Access to Government Information,” in order to improve access to government information. The Library explored and developed the methods needed to teach undergraduate students the information and knowledge-seeking skills necessary to succeed in college and throughout their lives through the “Information Literacy for the Information Age” component of this grant. Awarded 2000: The Library received a $500,000 grant from the James F. and Marion L. Miller Foundation and a $400,000 federal earmark grant mandated by Congress through the Institute for Museum and Library Services to migrate to a new Integrated Library System. The new system enabled the Library to more easily participate in statewide library resource-sharing programs. Awarded 1997: Approximately $50,000 in funding was awarded to the Portland State Library through a “Citizen Access to Government and Other Information” IMLS grant secured through PORTALS (a Portland-area library consortium). The grant enabled the Library to purchase a bank of wireless laptop computers, an interactive SmartBoard, and other equipment and furnishings to establish a second electronic classroom for information literacy instruction. Awarded 1997: Portland State Library was apportioned $26,500 out of a $1,000,000 Portals Cooperative Collection Development DOE grant to catalog maps in its collection. Awarded 1996: An LSTA grant entitled “Online Access to Arabic Vernacular Resources” was awarded to the Portland State Library and helped the Library begin the retrospective conversion of Arabic and Hebrew vernacular bibliographic records for materials in its collection. Awarded annually 1995 – 2011 [Grant program discontinued]: The Portland State Library received a matching grant award, the “Canadian Studies Library Support Grant,” from the Consulate General of Canada for several years. This grant award of $2,000 or more annually allowed us to strengthen our Canadian Studies holdings in order to support teaching and research in Canadian Studies, including topics in social sciences and the humanities, such as business studies, economics, law, education, communications policy, environmental studies, architecture, and other related fields.